This hand truck ships next business day FREE! Durable, sturdy, and lightweight aluminum frame. 500 lb weight capacity in the 2 wheel position. 1000 lb weight capacity in the 4 wheel position. Extra strong nose plate from aluminum alloy. Used by FEDEX®, UPS®, DHL® and other major transportation carriers. The RWM Senior Open Deck Hand Truck is one of our most popular convertible hand trucks. This hand trucks 10 inches taller than our RWM Junior and has a loop handle rather than double grip handles. This well made and versatile 2 in 1 hand truck is a favorite with delivery drivers, warehouse workers and stocking personnel. Industrial Solid Rubber 5" x 1.5" Black Casters. Hard Rubber Casters offer great floor protection, are quieter than steel casters, and are strong and chip resistant. Base Plate: 7.5" x 18"
The folding nose extruded aluminum channel extension is 20” & 30" in length and has a 300 lb. capacity. 20" Folding Nose Ext. 30" Folding Nose Ext. The cast aluminum stair glides have low friction acetal skid bars. They are great for easy moving on stairs and over curbs. Stair glides fit trucks with 8” or 10” wheels. Great for getting over curbs, stairs and other obsticals. RWM Senior hand trucks only. The brake casters are for convertible hand trucks. Set of two casters. Great for stopping hand trucks from rolling on hills or ramps. Brake casters will be installed on hand truck when ordered with the RWM Senior or RWM Junior Convertible. 5 x 1.5" Solid rubber replacement caster for convertible hand trucks. The caster will ship seperately in addition to your hand truck. this hand truck is light and easy to open and close without hurting myself.i deliver alot of 'copy paper,which weighs 50lbs per box and i have often put 20 boxes at a time onto my cart. Best carts being made. So glad they are made in America. Outstanding quality and durability. Bought many of these. Best by far. I bought this because I was doing a gut renovation of a condo. This little guy is a work horse and was the best investment ever. I must have used it to carry at least 10 tons in 2 months time and never had a problem. Highly recommended! This hand truck is awesome! I can't say enough about how much everyone loves this hand truck! We recently had to move cabinets and furniture around our office and it helped us a great deal. Vice President Operations at Stillwaters Lavender. We do a lot of shows featuring our products, and the hand truck makes getting set up and departure fast and efficient. We mainly Purchased the hand truck to move 900 1200 lbs heat exchanges. The unit worked fine and is still being used for other items. A very well built unit. Sturdy, quality made handtruck. But the darn thing is quite heavy. You get used to the weight but it's still not an easy thing to throw in and out of your van or truck. I recommend it but not for older gentlemen. We have been extremely satisfied with our purchase of the RWM Sr. Aluminum Convertible Hand Truck. It is well made and operates perfectly. 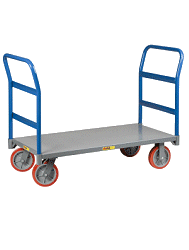 This Hand Truck is used daily and is very lightweight but can easily handle heavy loads. The quality is outstanding for the price. This truck is light and sturdy, and holds my complete Photo booth in one fell swoop... I would be lost without it. What a terrific hand truck. I recently used it to move to another home. It worked flawlesly and allowed me to move large heavy items with ease. Cones in very handy around the home. Worth every penny. Highly recommend. Hsnd truck is fine. I would purchase from you sgain. Great product saved a lot of time moving products. Great value for an extremely important peice of euipment, would buy again. I needed a 10 wheel for my hand truck when the original went flat. I found this on line, ordered it, and had it in a week. Efficient and inexpensive. Just what I wanted. I bought this hand truck and it is the best hand truck I have ever used. I love the option of standing it up or the ability to lay the hand truck flat to deliver product. Awesome! Truck is top of the line. Exactly what I needed. The hand truck that we purchased works wonderfully. Thank you very much. I would but this truck again. It's great. This hand truck is well build, can handle very heavy load, i use it daily, hauling cases of copy papers at ease. i am a return customer, i highly recommended this one verse more expensive other that do that same job. Like a HONDA it's tough and last forever. it's an excellent hand truck that can handle very heavy weight as it said, like a Honda it run and runs forever. i am a return customer, and i highly recommended this one verse the more expensive ones. The breakdown handcart is great. It has the dual function that we were looking for matched with durability. I love how lightweight and versatile this cart is for an older art fair exhibitor! Great quality,super value and free delivery!